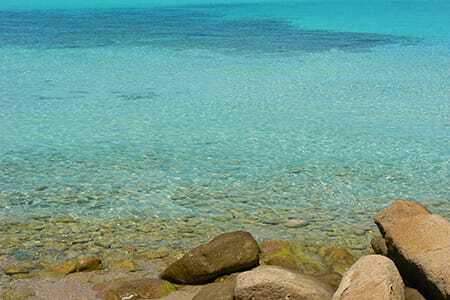 Sardinia Holidays For Couples: The Ultimate Guide on What to do and Where To Stay! Click on the links to go straight to the chapters you need! You’ve probably already long realized that Sardinia is a wonderful destination for a perfect vacation, so it won’t come as a surprise to hear that there are plenty of ways for couples to enjoy a romantic holiday in Sardinia too! Whether you’re young lovebirds looking for a place to create happy memories, celebrating a special occasion such as an anniversary or birthday, planning a perfect honeymoon, seeking somewhere incredible to propose to your partner, or just looking for a deliciously romantic destination to enjoy together, Sardinia is fantastic! 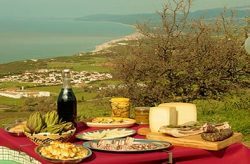 I’ve received loads of requests from loved-up couples who want to enjoy the very best of romantic Sardinia, so whether it’s a special occasion or a hard-earned romantic escapade that you’re looking for I’m going to share with you some spectacularly romantic Sardinian hotspots to make sure you have the very best loved-up holiday possible on my stunning island. From the best places to watch a magical sunset and the top beaches for couples in Sardinia through to the most intimate places to stay and restaurants that will certainly put you in a passionate mood, and, of course, a variety of activities and attractions to help you make the most of your time in Sardinia with your beloved, get set for one fabulously and blissfully romantic vacation! Whether you and your partner prefer secluded and quiet spots or whether you’re a couple that is looking to enjoy Sardinia’s livelier romantic spots you’ll find somewhere that is absolutely perfect for you. 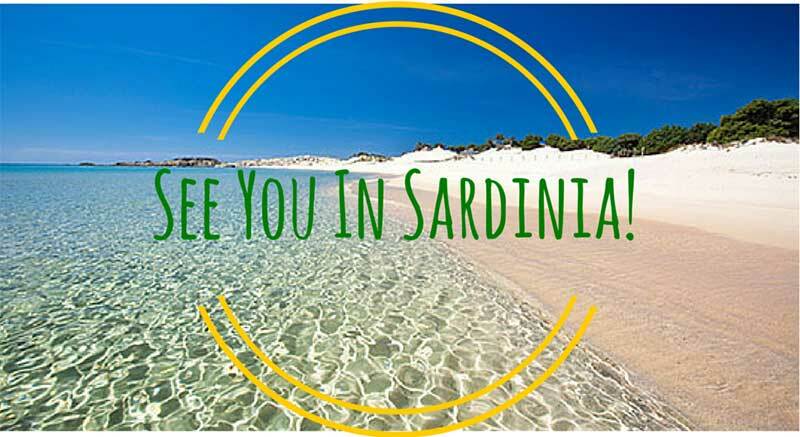 Are you looking for a free ready to use itinerary to visit Sardinia in one week? Even if you’re looking for the best of both worlds, with so many excellent options why restrict yourself to just the one place if you have time to play with? 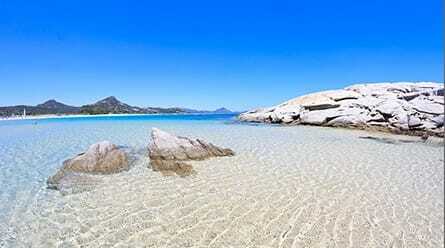 Mix and match for a terrific, varied, and dreamy holiday in Sardinia with your loved one. Wait until the maps load, zoom in or out and click on the marks to see the places of interest in the area, so you have an idea on how far apart they are from each other! If you and your partner love up-market destinations and living the high life, Porto Cervo offers huge lashings of romance and the high life. Make sure you take your best clothes though as it is super posh and you don’t want to look out of place! It also comes with a pretty steep price tag, so be prepared to splash the cash and splurge a fair bit. 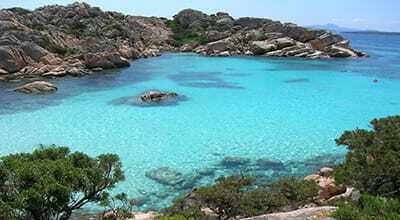 Situated on the dazzling Costa Smeralda it is close to some of the finest beaches in the world. Don’t believe me? Take a peek and see for yourself! Each beautiful beach has its own vibe, from the busier sands in the south to the more relaxed and tranquil beaches of the north. If you are a fun-loving couple that likes to be in the heart of the action the southern beaches will be better for you. If, however, you are looking somewhere where you can enjoy your own little slice of paradise in relative exclusion, head north. Either way, lively Porto Cervo is close to hand. Sometimes called by its full name of Spiaggia del Principe, this is one of the area’s most stunning beaches. It is difficult not to fall under the tender spell of love at this beach in the Porto Cervo surrounds! Two glorious beaches with multi-coloured waters and soft sands with dunes and amazing snorkelling. A busy beach with gleaming white sands, sparkling emerald waters, and interesting rock scenery. Although the beaches are the main things to do around Porto Cervo, there are also other activities to enjoy in the area! 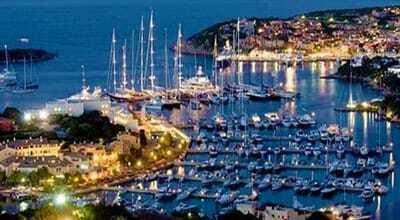 Let your imagination run wild as you ogle the lavish and luxurious super yachts that dock there of an evening. Couples can dream together and imagine a life of blissful opulence sailing across the Sardinian waters. You can also hop aboard your own boat (although not a yacht!) and enjoy boat trips around the coast. Postcard-worthy views and some of the most incredible scenery are all but guaranteed to get you excited! The pristine beaches are usually pretty quiet and it is quite easy to find a spot where you can be completely alone with your lover. 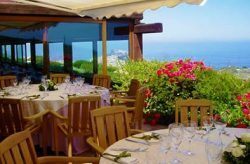 Porto Cervo is also a terrific place for romantic couples who like to party hard … the nightlife is one of the best on the island and you can mingle with the jet set in many stylish bars and energetic clubs. Beautiful furnishings and décor with a mouth-watering menu make this a top spot for diners. What makes it even better for couples is that there is plenty of space between the tables, giving you some more privacy! The views are one of the main reasons to try out this quaint and rustic place, although the food is really good too! 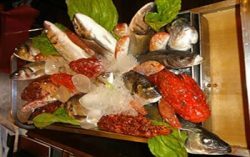 Taste lots of Sardinian specialities as you gaze at the small islands that dot the shimmering waters. Uber trendy, you’ll be tucking into your tasty seafood alongside some of the area’s most fashionable and stylish crowd. This is one of the most popular restaurants in the area! I’ve selected a few places where you can stay during your visit to Porto Cervo, from the budget ones to the fanciest ones! Private beach and an à la carte restaurant, I Giardini Di Porto Cervo offers self-catering apartments with views of the Coast. With an outdoor swimming pool, Casa Della Marina offers self-catering apartments in Porto Cervo, 200 metres from the seafront. 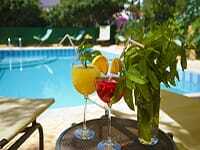 Colonna Hotel is near the white sandy beach of Cala Granu. It offers 3 swimming pools, tennis courts, and a scenic jogging path. There are always pros and cons for each destination you choose for your romantic break, here are the main pros and cons of Porto Cervo! Overall, Porto Cervo is great if you like soaking up the sun on pretty beaches, elegant eating and drinking, and a sophisticated and refined ambiance with lots of other like-minded people all around. 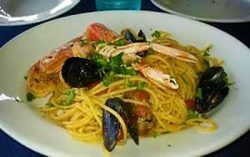 It’s also important to note that if you are on a budget, you can visit Porto Cervo on day trips, and stay in more traditional and less expensive villages nearby like Cannigione, Arzachena and San Pantaleo. 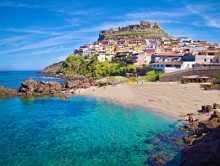 Situated in the north-western part of Sardinia, Castelsardo manages to combine romance by the bucket load, fascinating historical sites, magnificent beaches, superb scenery, and lots of places to eat, sleep, drink, and relax. Love will almost definitely be in the air in Castelsardo! The small village has an intimate air and plenty of things to see and do for couples who enjoy romantic sightseeing and explorations together. With over 900 years of history, you can celebrate your own long-lasting love as you discover charming Castelsardo. 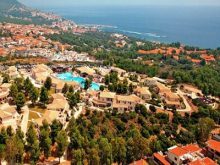 If you want to chill out and hit the beaches together and soak up some warming Mediterranean sun you’ll be delighted to know that there are several soft sand beaches with clear waters that are suitable for swimming really close to the village. The beaches are ideal for sitting side by side and watching the changing colors of the sky as the sun goes down. 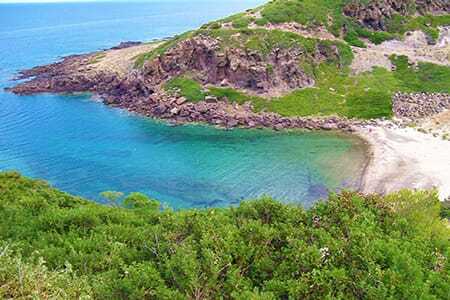 Cala Ostina is a lovely cove, 5 minutes away by car from Castelsardo Village. You can enjoy this fantastic secluded beach, perfect for swimming in its turquoise waters or simply relax and sunbathe all day! One of the best beaches near Castelsardo, the water is always clean and shallow for meters from the shore, ideal to walk and swim. It has a sandy and a rocky part which creates a lovely contrast! 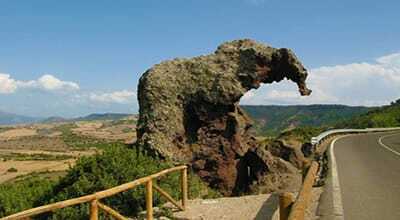 Elephant Rock (Roccia dell’Elefante) is a large mass of trachyte stone standing beside State Road 134, a mere 10 minutes ride by car from Castelsardo. Following a process of erosion, the rock assumed the appearance of an elephant! Perched upon a rock and the village’s namesake, you can enjoy incredible views, have fun together exploring the beautifully evocative ruins, and see lovely handicrafts and local finds in the museum. A great sight to combine history, Sardinia traditions and the romantic panorama! Ideal for architecture enthusiasts and fans of pretty buildings, the cathedral showcases some excellent Renaissance and Catalan Gothic designs. The high tower and stunning ocean vistas add to the overall beauty of this magical place! 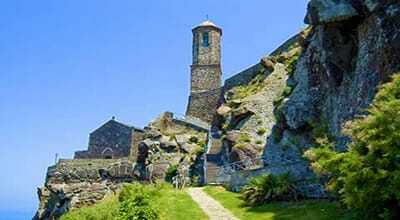 Sitting on the rocks and looking out to sea, this old tower is a beautiful place to linger with your love. Below the town of Castelsardo, the tower, thirteen metres tall, stands as the defensive outpost of the small port of Frigiano. If you’re part of an active couple you can enjoy amorous adventures in the nearby surroundings; explore the scenic woodlands and enjoy the picturesque views by foot, bicycle, or horseback. Castelsardo is also a brilliant base for exploring other attractive nearby villages and towns such as Tergu, which boasts even more delightful historic buildings, and the quiet town of Sedini where you can enjoy the peaceful atmosphere as you visit one of the island’s best museums. Treat your senses with delectable seafood and stunning panoramic views. Cute and intimate, this small restaurant is one of the best places for simple home-cooked delights. An elegant atmosphere with terrific service and fine food, there is lots of space and awesome views too. Below are a few places where you can stay during your visit to Castelsardo, from the budget ones to the fanciest ones! 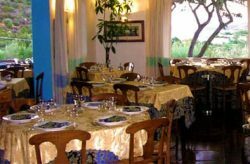 Rosa dei Venti is located in the touristy town of Lu Bagnu, 3 km from the centre of Castelsardo. Rooms offer views of the sea. Vicolo Della Luna is 130 metres from the coast’s promenade. It features a spacious furnished sea-view terrace. Set on a hilltop overlooking the medieval village of Castelsardo. It features a swimming pool and sunbathing area. Castelsardo is a popular destination for day-trippers, which may well work to your advantage if you like quiet and romantic evenings away from the crowds – with many visitors leaving in the afternoon you can enjoy evening walks, dinner, and drinks without thinking about people all around you. Excellent sightseeing and Historic Atmosphere. Beautiful landscapes close to hand. Cheaper than other Sardinian places in the North. Few opportunities to socialize with other visitors. You need your own car to move around. The beaches are great but not the best of the best. 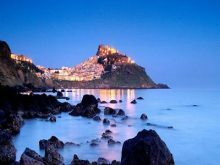 Overall, Castelsardo is recommended for couples who like to combine sightseeing, beach days, and countryside excursions, and who also enjoy a calm atmosphere at the end of the day. 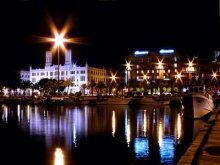 Sardinia’s capital of Cagliari is packed with romantic interludes, in the right company of course! If you and your partner enjoy city breaks injected with huge dollops of romance, Cagliari could be right up your street! The hours will fly by as you explore the historic quarter and visit interesting museums and you can also make the most of the vibrant nightlife and nearby beaches. Cagliari is my city and I can tell you without any doubt that a stopover in the Capital is the perfect choice to take day trips to the most incredible beaches you’ve ever seen in your life! 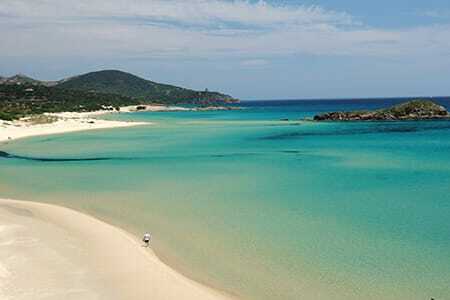 One of the most beautiful beaches in South Sardinia. One hour away from Cagliari, it offers golden sands and a breathtaking view from its small rock cliffs which can be reached from the shore on foot across a stretch of particularly shallow water. Oh I love this beach so much!The beach of Marina Rei has fine, light-coloured sand. The sea, of extraordinary transparency, puts together its spectacular chromatic variations from turquoise to the emerald green. To die for! The beach of Punta Molentis is distinguished by its bright, white sandy shore. 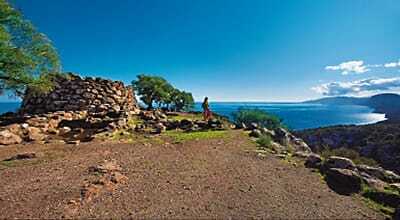 The backdrop to the beach presents a hill which rises to 101 metres, where ruins of a nuraghe can be found. The sea has wonderful colours, and the landscape offers splendid, naturalistic scenes. 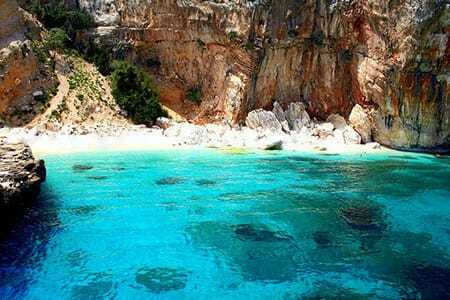 Tuerredda: My favorite beach!it is considered one of the most beautiful beaches in Sardinia for its transparent colour of the sea that recalls a Caribbean landscape. In front of the beach is the islet of the same name, a few hundred meters from the shore. Awesome! The Poetto beach is truly vast, stretching as it does between Cagliari and Quartu Sant’Elena, and closed off at one end by the Sella del Diavolo Headland. This was the beach where I used to spend my days after school, a great city beach, you can’t miss it, and it’s very easy to reach by public transports. Offering a fantastic vantage point for sweeping views across the surrounding areas, the climb up the limestone rock is well worth it. And, don’t worry – there are steps carved into the rock! 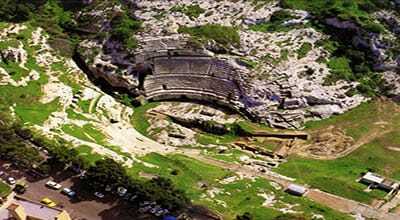 See the Cagliari of the distant past as you enjoy the Roman ruins in the here and now with that special someone. If you’re a couple that are into fine dining and pumping nightlife don’t miss the vibrant Marina. Stroll around the area at sunset, enjoy the view of Poetto beach and find a quiet spot to sit on a rock in front of the beach and simply relax! This si such an Iconical place in Cagliari! 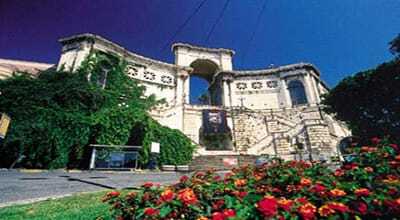 You can’t say you’ve really seen the city if you didn’t visit the Bastione! Not only is one of the most romantic places, especially at sunset, but the whole atmosphere is simply awesome. The breathtaking view of the city, the restaurants and the best direct access to the old Quartiere Castello, makes it a must see! Escape town life and relax in this attractive park for a while as you enjoy the peaceful and tranquil atmosphere. The solitude makes it easy to steal a cheeky kiss as you sit side by side on the lush grass and it could also be a prime location if you are planning to pop the big question. I told you that It would take me days to list everything, but being Cagliari my territory, I’ll give you a few more gems! Despite the name translating to the off-putting Devil’s Saddle this is actually one of the top spots for lovers in the whole of Cagliari. The challenging sections of the approaching pathway offer the prime situation for holding on to your dear one, and once you reach the end you are likely to be blown away be the gorgeous views. Wander through the narrow maze-like streets and lose yourselves in this historic and pretty part of town. Definitely worth a visit! 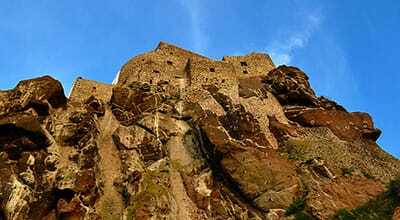 A medieval visual feast, set your imaginations free as you explore the nooks and crannies of old castles, follow the imposing defensive walls, get high – literally! – and enjoy the fabulous sweeping views as you climb the tall towers of San Pancrazio and Torre dell’Elefante, and marvel at the beauty and serene atmosphere of Santa Maria Cathedral. There are other cute churches to visit too. Plenty of artisans sell their wares and you can pass several pleasant hours at the ornate palace and interesting museums. This part of the city is really worth lingering over and taking your time to savour the many delights. Numerous excellent restaurants offer the perfect chance to stop for a rest and a bite to eat. A perfect place to be at sunset is the Bastione di Saint Remy – it really doesn’t get much more romantic than this! One of my favorite spots in Cagliari, a small plaza full of restaurants, bars and yummy gelato to spend a lively night and socialize with the locals! Piazza Yenne is perfectly located if you want to visit the surrounding areas by foot. If you have just arrived in Cagliari, start from Piazza Matteotti, right in front of the pier, the train and bus station and take a stroll in front of the pier. Then head up to Largo Carlo Felice street where piazza Yenne is located, on top of the street. You can continue your walk on the right to Via Manno and Via Garibaldi, famous for their many shops, and end up at the Bastione di San Remy (right at the end of via Garibaldi). From there you can take the road going up on the right to the “Terrapieno” area, a scenic walk around the city walls where you can enjoy the city view from top, admiring the buildings and even spotting the famous Poetto beach. It’s a fantastic and romantic walk, especially at sunset! 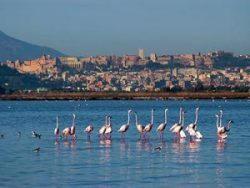 In addition to the terrific things to do within the city there are also several great day trips that can be easily undertaken from Cagliari, although renting a car is the best option unless you join a tour. Journey to even more glorious beaches, (see the section above), cruise to the volcanic island of San Pietro, step back in time at Roman Nora, be awestruck by the intriguing rock formation of Arco dell’Angelo … and more. 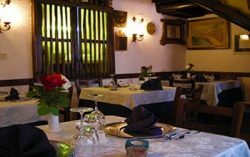 Dine in style at this wonderfully charming establishment that has been enchanting couples and keeping them more than satisfied since the 1800s. 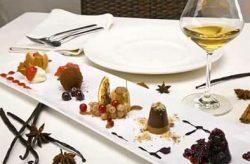 Head here for the ultimate fine dining in Cagliari with your partner. Soak up the chic ambience as you enjoy the impeccable service! 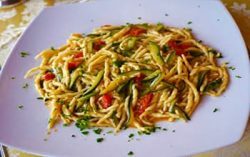 The menu uses the best Sardinian ingredients to create popular meals, some with an added twist. It is a fine place to indulge in a bottle of the best Italian wine with your darling. Ever have those times where you just can’t decide what you fancy to eat? Or maybe you and your partner want to try different things. 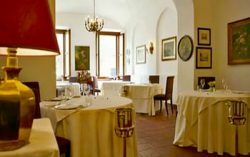 In this case, a trip to Ristorante Luigi Pomata is highly recommended. 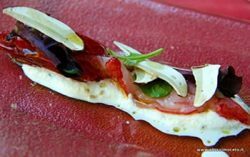 As well as a tantalising array of fish and seafood dishes you can also opt for some good old Italian favorites, sushi, and inventive fusion dishes that are sure to set your taste buds tingling. The informal atmosphere is ideal if you want to keep things low-key and simply chill out together. The best places to stay when you visit Cagliari, from the budget ones to the fanciest ones! Set in the heart of Cagliari, in the Castello district, L’Antica Torre offers free Wi-Fi and rooms with air conditioning and TV. Al Porto Di Cagliari is located at 200 metres from the harbour. 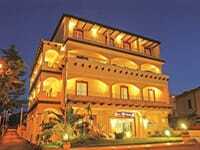 Rooms are air conditioned with free Wi-Fi and satellite TV. Set in Cagliari’s historic centre, Hotel Regina Margherita features modern rooms with satellite TV and a hydromassage shower or bath. If you take pleasure from a mixed bag of things to see and do on your couple’s break, Cagliari is perfect. Variety of activities and sights. Accommodation to suit almost any budget. Faster pace of life than in other parts of the island. Need private transportation to get out of the city. 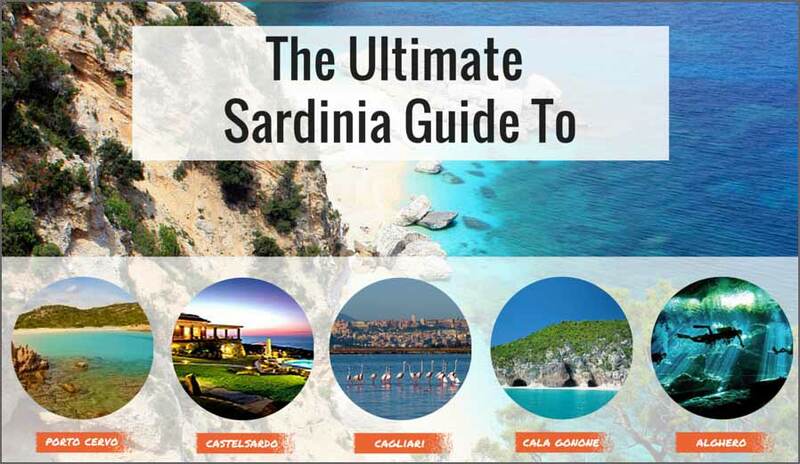 Fewer chances to experience Sardinian culture. In one of my absolute favourite parts of Sardinia, Cala Ganone is one of the ultimate destinations for a romantic getaway. Located almost in the center of the eastern coast, the journey here in itself is a treat! In the past, you had to come by boat, but there is now a road that tunnels through the mountains and snakes its way around twists and turns near to the coast. 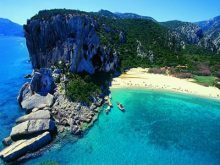 It is a spectacular drive and, although this may not be the most accessible of places in Sardinia, you will almost certainly be glad that you choose Cala Gonone for a few days of fun and discoveries. With the magnificent mountains behind you and the sparkling sea in front of you, get ready to be clicking away and snapping loads of selfies of you and your partner in some truly outstanding locations. The Golfo di Orosei beaches are my persona favorites. Undeveloped and wild stretches of rugged coast, greenery-clad jagged mountains, turquoise and emerald waters.. No matter how long you stay, you will wish it were for longer! Boats are the easiest (and sometimes only) way to reach many of these paradise places. Also note that the picture I placed in here show the beaches when no one is there, but you need to consider that in high season they can be crowded, so don’t be disappointed if you have to share paradise with other people… that’s the price to pay to see these marvels! My Favorite beach in the Golfo di Orosei, rated #1 in the Area, click below to know more about how to reach the beach, prices for the boats and more! The only way to reach this awesome place is by boat, there is also a path but I’ve never met anyone who attempted it so I can’t give you more info on that, as they say it’s quite difficult. You can either rent a small boat for the day or join the organized tours. Bring a resistant towel: The beach is formed by small smooth white rocks so take with you a good quality towel and always walk with some beach shoes. Scuba Dive in Cala Mariolu: make sure to ask the company if the option is still available (it might change depending on the season) and how much is it, as you’ll have to pay extra. 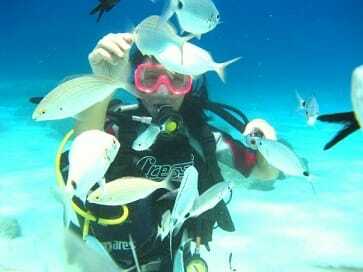 Me scuba diving and feeding the fish in Cala Mariolu, fun times! Don’t Miss the boat: Make sure to remember the name of your boat and get ready 5 minutes earlier than the time the crew told you they were going back to pick you up. Take some food and water with you: The beach is wild and there are no facilities in there, so make sure you have a snack and plenty of water. Always ask the company id the lunch is included (it usually is). Bring your snorkeling gear: The company usually don’t provide the gear for snorkel and Cala Mariolu is a good place to swim around the rocks and small caves and watch the fish, so don’t forget your snorkeling gear! Don’t leave any valuable item on the boat: Always bring everything with you when you leave the boat. If you want to save your spot for when the boat comes back to pick you up, just leave a towel (I always do like that as you usually won’t have assigned seats). 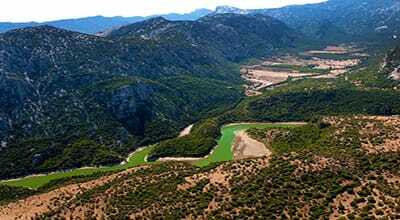 Do you want to combine an amazing UNESCO site with the wilderness of the mountains? Trek down the path to reach this fabulous beach! To get to Cala Goloritze’ drive towards Baunei, a small village, near to the beach. You should take the SS125 Orientale Sarda (that’s the name of the road), directed to the south and head to Baunei. It will take around 1 hour to get from Cala Gonone to Baunei and from there is another 15/20 minutes to get to the parking lot. You will easily find the place as there are many signs on the road indicating Cala Goloritze. From there, there is a wooden sign that indicates the path to go down. Don’t forget to bring a lot of water with you, towels, food and a good pair of shoes for the hike. It’s not super difficult, but you have to be careful. Arriving by boat: You can also arrive by boat, but you can’t go near the beach so you’ll have to swim to reach the beach. I did it and it was exhausting! Next time I’ll bring an inflatable mattress with me. Much easier! 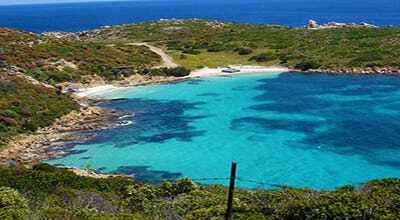 A truly unspoiled paradise in Sardinia! if you are in the Cala Gonone area you can’t miss this wild beach ..(watch the video on “more Info”)! The easiest way to reach this fantastic beach is by boat, but always make sure to ask the company if they plan to stop in there as not all of the boats do. You can also hike, but it’s a rather difficult path so it’s not advisable unless you go with the locals and you’ll have to be quite fit as the hike involves the use of ropes to climb up and down the rocks. Snorkeling time! : Don’t forget the snorkeling gear as this beach is a perfect spot for scuba diving and swimming. 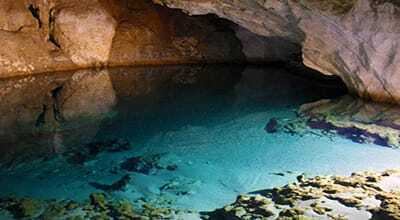 The water is quite shallow and safe near to the shore and the wilderness of it will make it for an unforgettable day! A beautiful beach, slightly more spacious than the other ones and reachable by boat or a fairly easy trek! Using your car is a must for the trek! The easiest way is always the usual boat trip starting from Cala Gonone (as for the other beaches, make sure to ask whether the boats stops in there or not. 1 | From Cala Gonone to Baunei: see my indications under Cala Goloritze beach on which road to take to get there. 2 | Baunei—> Church of San Nicola: Reached the village of Baunei go along the main road towards Tortolì until you’ll reach the Church of San Nicola.Turn left onto a narrow road uphill From this point follow the signs to the plain of the Golgo. 3 | The panoramic view: After a series of steep switchbacks, you’ll get to a plateau, a panoramic point where you can enjoy a beautiful view that sweeps from the village of Baunei up to Tortolì and the Arbatax harbor. 4 | Reach St Peter Church: Go ahead on the asphalted road for about 7 km until you reach the church of St.Peter, from this point on, the road turns into a dirt one, yet it is still ok to drive. A little before the church turn to the right into a 15 km road that takes you down to the beach. 5 | When to leave the car and walk: The road allows you to get to the third “parking lot” where you can leave your car, at about 5 km from the beach. 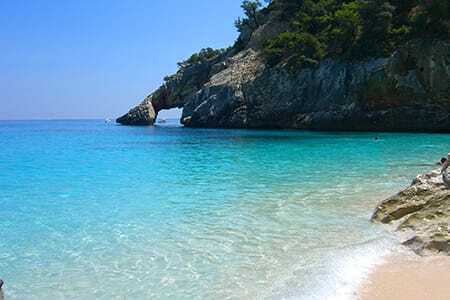 6| The trek: It is a pretty easy one, the path is relatively flat and does not present any problem of orientation as it is very obvious.Especially the last stretch that emerges in the beautiful beach of Cala Sisine that is nothing but the mouth of the river. The large beach is made up of some stretches of fine sand and others of pebbles and is located in front of the Plumare rock tip. The water is emerald and turquoise and it’s ideal for snorkeling. On the beach , in the summer months it is running a Bar Restaurant where you can camp for an unforgettable night enjoying the silence broken only by the sound of the waves crashing on the shore and the sounds of the seagulls that populate the beach . Want to reach another great viewpoint from there? Head to the left of the beach and follow the first part of the route to Cala Luna , from here after a series of hairpin bends you will find yourself above the Cala where you can enjoy a breathtaking view with that ranges from Cala Sisine to the shores of Cala Gonone . Spacious beach, famous for its grotto where people find shelter from the sun while enjoying the view of the beach! If you love trekking, the beach is also accessible through a difficult path, only for real experts, departing from Cala Fuili or Baunei. This corner of nature was chosen as the set for the film “Travolti da un insolito destino” both in its version with Mariangela Melato (1974) and in the remake “Swept Away”, with Madonna as lead actress. The beach has a bar and a café, and is characterised by shallow waters. It is possible to hire a pedal boat and it’s also great for snorkel and scuba dive lovers. 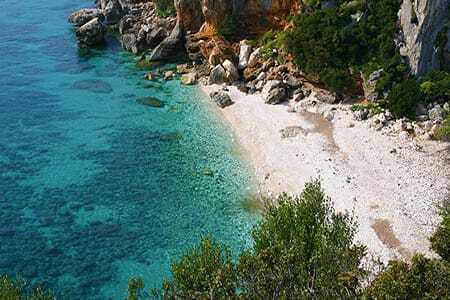 Cala Osalla is the most popular beach near the village of Dorgali, easy to reach and wonderful sea as usual! 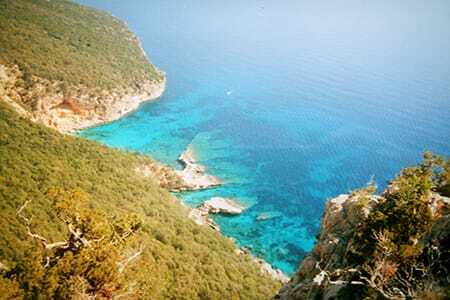 Cala Osalla di Dorgali is easily reached by driving the SS 125 panoramic road and, before getting into the town of Dorgali, turning towards the cave of Ispinigoli (a must see). Turn again towards the locality of Tinnipereddu and after around 4 kilometers you will be at the beach. 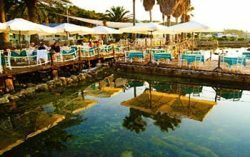 There is a bar near the beach and it’s another great spot for snorkeling, which is true for all the beaches in the Golfo di Orosei coast! 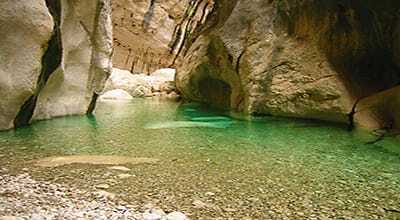 A 50 minutes drive from Cala Gonone, this is another beautiful option to explore in the Golfo di Oorosei area! 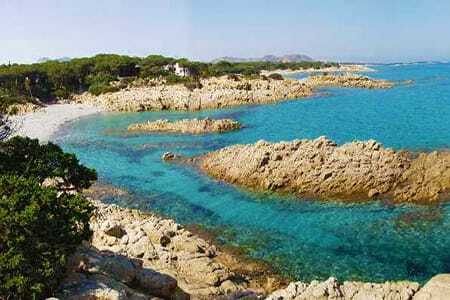 Cala Liberotto is a lovely beach near to Orosei Village, on the northern side of the Golfo di Orosei. If you are staying in Cala Gonone (which is on the south side) you’ll have to drive on the panoramic road SS125 for 50 minutes. Follow the signs along the road near the town of Sos Alinos and you’ll get to the beach quite easily. There are plenty of amenities available on this famous beach. Umbrellas, sun lounges and pedal boats for rent. The water is shallow near the shore and very safe for swimming. Like any other beach in Sardinia, in August is quite crowded, especially during the weekends! Less than 4 km away from Cala Gonone Village, this beach is a lovely one, easy to get there and just spend the day relaxing! You can easily reach Cala Fuili driving the SS 125, turning towards Cala Gonone and entering the street “Viale Bue Marino”. Then drive along the coast road 26 bis until you reach its end: You can access the beach through a series of steps cut into the rock. There are no facilities on the beach, so bring your own lunch and drinks, There is a parking area available and the turquoise sea is perfect for snorkeling! The beach is very small, and it can get very crowded in peak season (especially in August). During low season you can enjoy the peaceful vibe and you’ll feel like you’re miles away from civilisation, completely surrounded by the wild nature! 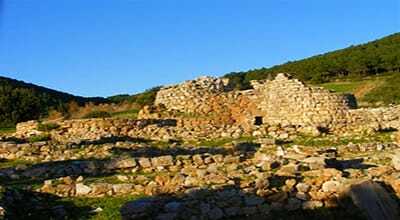 There are several fascinating ruins from prehistoric times scattered around Cala Gonone. See how these ancient people lived and wonder at the collection of stone towers that this mystifying civilisation left behind. There’s a large group of Nuraghes at Serra Orrios and another great place in the large and evocatively run down Nuraghe Mannu; enjoy the views as you sit at the top of the gorge and underneath an olive tree. 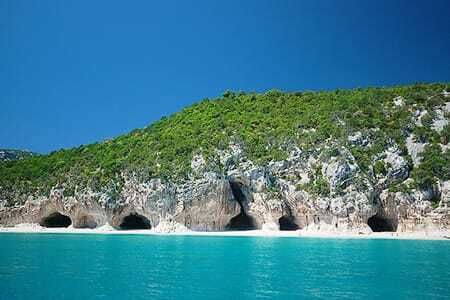 The most famous of Cala Gonone’s sea caves, a visit here is incredibly hard to forget! Hauntingly beautiful, the chamber is filled with unusual rock formations and Neolithic rock paintings, with light streaming in and casting imaginative reflections on the water and really seeming to breathe life into some of the awesome shapes. Escape into the cool and refreshing mountains for some hiking, climbing, mountain biking, and nature spotting … and, for that lovely feeling of being truly at one with your partner and the world.The park boasts cascading waterfalls, soaring mountains, deep gorges, and an abundance of native flora and fauna. Creatures to look out for include Sardinian wildcats, Sardinian foxes, weasels, mice, tigers (just kidding on that one! ), and many different species of birds. Close to the main beach this spot doubles as a café by day and a bar come evening time. A great place to spend your night! Food is simple yet filling and tasty and you can round off your meal by sharing a sweet artisan gelato. In the summer months you can really get in the holiday swing with the lilting sounds of Cuban music. Right next to the port there is a choice of indoor and outdoor seating, both of which afford great views out over the water. A gourmet seafood and fish restaurant, your biggest problem is probably going to be deciding what to actually have – the menu items all look so tempting! If you really are stuck, however, I’d recommend the set platter for a taste of a few different things. Don’t be fooled by the name – even though it doesn’t sound very Italian (at all!) the menu offers a wide choice of tasty traditional eats. And the portions are huge! Perfect for if you and your loved one like to share. Located on the seafront soak up the views and feel the cooling sea breeze gently blow as you dine in this romantic setting. Check the Reviews on Tripadvisor! The best places to stay for you visit in Cala Gonone, from the budget ones to the fanciest ones! At 600 metres from the seafront, it has climbing and diving schools.Furnished apartments with a sea view balcony. High above the Mediterranean Sea, this country house offers a peaceful countryside location, 4 km from Cala Gonone. Just 350 metres from the seaside, it offers air-conditioned rooms. It features an outdoor pool, a large terrace and a garden. 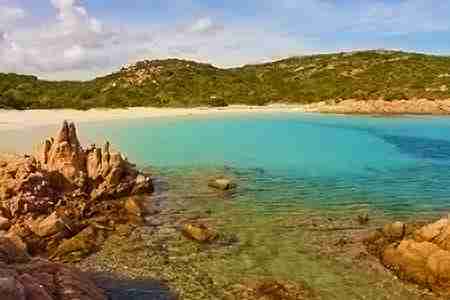 One of the most beautiful places in Sardinia! Remote location makes it feel really special. Rugged cliffs and coastal areas. Other than the journey may be a bit off-putting for some, I really cannot think of any other cons! This place is amazing! With Catalan heritage and a gorgeously preserved old centre of the town, love birds can feel like they’ve slipped back to a completely time and place as they enjoy the unique and special character of this beautiful area. Although very popular with visitors it also manages to present a wonderfully natural and simple face. 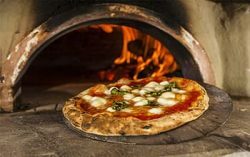 There are numerous traditional pizzerias where you can relax a while, admire the surroundings, and enjoy each other’s company over a shared Sardinian pizza. 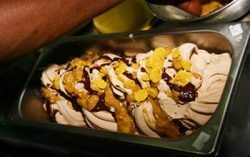 Nightlife is low key and relaxed, but there are lots of little tucked away bars where you can share a bottle of wine and places where you can drool over a gelato for some laid-back romance in Alghero. There is also the modern part of the city with its hustle and bustle of activity, as well as delightful beaches, a big marina, and a busy fishing harbour. Sadly, it is impossible to stay somewhere lovely that is at a comfortable walking distance to both the old town and the most amazing beaches around, so you will need to choose one as your base and journey to the other. 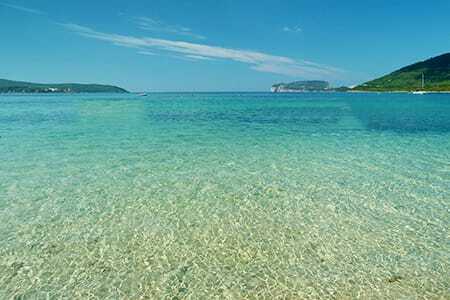 The most popular and gorgeous beach around Alghero! This place has really nothing to envy to the Caribbean sea! It takes around 1-hour drive to reach paradise! From Alghero, go along the SP 42 main road in the direction of Porto Torres; In 30 minutes you’ll find the indications to Stintino ( SP 57 road on the left) until you reach Pozzo San Nicola Village and then take the SP 34 to Viale la Pelosa in Stintino. Before reaching the town, and before the Spanish Tower, there is a dirt-track road to the right that leads to the Spiaggia delle Saline. After 300 meters from the bridge on the pond of Casaraccio, you’ll find an intersection: Turn left continuing to the intersection to reach the beaches. From Stintino the beaches are also reached by shuttle services. Since the picture speaks for itself, I’ll only mention that the beach has a car park, a restaurant and a bar. You would want to take your own umbrella and maybe an inflatable mattress to lay on the white sand or relax in the water! Don’t forget to bring your camera as the beach is truly spectacular and if you go during peak season, it’s advisable to be there as early as possible as even if the beach is quite big, it can get very crowded! Do you want to sit down a rock and watch a fantastic sunset from the beach? Then this place is perfect for you! The beach is around 45 minutes away from Alghero town, you need to take the SP 42road, until you find an intersection to Palmadula (on the left), continue along the SP 18 provincial road in the direction of Argentiera, and the beach is found beneath the buildings of the ex-mining establishment. The beach itself is truly awesome, surrounded by the mine buildings that give a very suggestive vibe to the beach. Its sea is ideal for underwater exploration, and the gentle sea shelf keeps the waters shallow out into the bay and perfect for swimming safely. The beach has an ample car park and is easily accessible to wheelchairs. It is an ideal spot to spend relaxing days, not only because it is not crowded, but also for the fact that it has a convenient refreshment area. Perfect if you want to combine crystal-clear waters with a beach full of amenities, with a bar, restaurants and a picnic area! 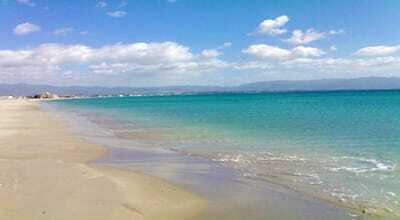 Mugoni beach is quite easy to reach from Alghero ( only 30 minutes away from the town). It can be reached along the Provincial Road 55; the sign indicating the beach can be seen on the left, 8 km before Capo Caccia. If I put the beach among the best nearby Alghero, it’s because it’s worth it (therefore also pretty popular!). It is a very large beach with fine white sand and emerald green water, which is particularly calm and warm, thanks to its sheltered position from the winds. Mugoni beach perfect to spend a holiday in complete freedom; there is a large car park and an area for camping. If you are not into camping, do not worry! You can find a Hotel nearby and refreshment points along the beach. You can also hire a “pattino” boat or scuba dive/ snorkel and it’s also great for surfing and windsurfing when the winds get strong. The beach has easy wheelchair access. Another well famous beach for its water wonderful colors and the numerous amenities, including a very convenient shuttle bus from Alghero. This fantastic beach is the easiest one to reach from Alghero, as it’s just 20 minutes away by car. You’ll have to past the inhabited area of Fertilia on the SS 127bis main road; shortly after the 44-kilometre marker you will spot the signposts to the beach. The beach has plenty of amenities to spend a relaxing day! There is a restaurant and a cafe and you can rent beach umbrellas, sun-loungers and pedal boats. If you want a more adventurous holiday, Le Bombarde is the perfect place for you as it’s one of the few places in Sardinia where you are still allowed to camp on the beach! The beach, with wheelchair access, has a very large car park, equipped for campervans. if you are into Scuba Diving and snorkeling, Le Bombarde is a great place to put on your flippers and mask and discover the underwater world! If you have time and you want to take a boat trip that you will surely remember, head north and take a boat trip to the Asinara Park, a beautiful Island and ex-prison now populated only by…donkeys! 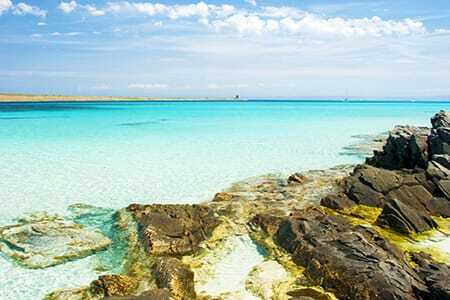 The Island can be reached from Porto Nuovo at Stintino and from Porto Torres, where visitors will find information and ticket. If you want to rent a Catamaran, check out this website. 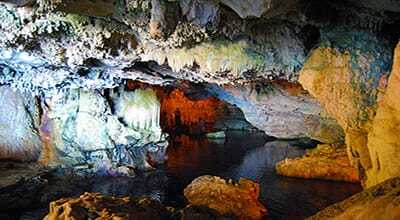 At the bottom of a dramatic cliff, this is a wonderful natural attraction near to Alghero. Try and time your visit for the late afternoon / early evening so that you can also enjoy the sunset over the sea. If you would rather get to the caves on your own and enjoy some together time rather than as part of a group, it is also possible to cosy up on a rented scooter and get there independently by road. An ancient palace and complex, if you both take pleasure from exploring long-abandoned remains from yesteryear I would really recommend adding this to your itinerary. The ruins are hauntingly beautiful and it is easy to imagine what the complex must have looked like in its former days of glory. Poke around in the small huts and see how people of the past lived. The Alghero rocky surroundings are perfect for Scuba dive and snorkeling addicts. Check out the beaches I’ve mentioned above as almost all of them offer great opportunities to spot some great underwater life! 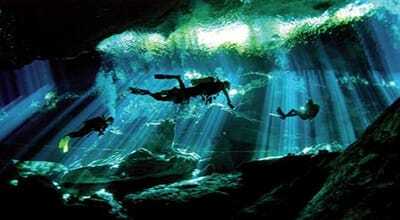 For more information on diving sites and prices, check out this website! 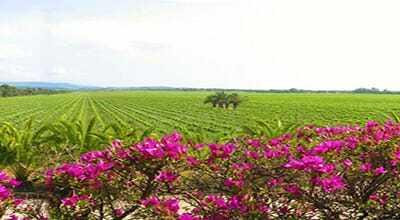 A really romantic experience, check out Alghero’s lovely Sella and Mosca vineyards. Take a tour of the expansive vineyard and raise a toast to each other as you sip on some delectable locally produced wines. 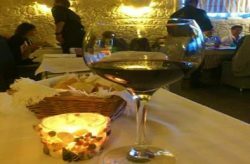 This experience is also great for all the people who want to discover more of the traditional Sardinian culture, and it’s obviously perfect for wine lovers! 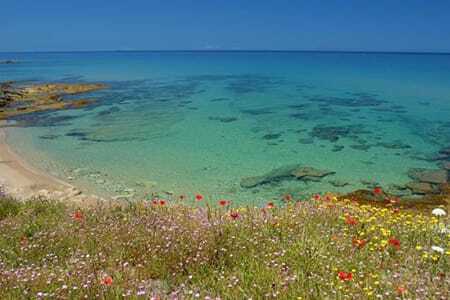 Do you want to discover the real deal near Alghero? Relxing with some Yoga combined with some fascinating hikes, sailing, biking and much more? Gabriella from Break To Sardinia is what you need! 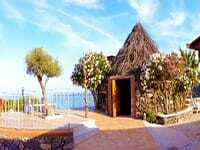 She offers weekly or tailor made packages to let you experience the real Sardinia. You’ll sleep in lovely B&B and eat local food, just like… a local. For more info check my dedicated page in here! A little away from the main cluster of restaurants, eating here can really feel like you’ve found somewhere truly special. Located inside a charming old building in the historic heart of the beautiful Old Town, this Michelin-starred restaurant is a real winner. Lunch and dinner menus are both available depending on the time of the day and the seafood dishes are especially divine. Set meals let you share a well-thought-out selection of traditional specialities. Meals are so beautifully presented you may hesitate before actually eating! Stone walls, crisp table linen, an intimate vibe, and an attentive Maitre D make for one top class memorable dining experience. A pretty little place overlooking an attractive harbour, try and snag a table right next to the sand for the dreamiest time with your love. 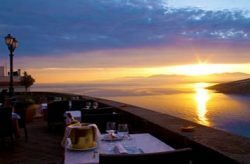 The views are outstanding, and you really will be in for a special treat if you are dining at sunset. Eat tasty seafood, pizzas, and other Italian favourites al fresco as the sun slowly sets over the sea. It can get quite lively on karaoke evenings. The best places to stay for your lovely stay in Alghero, from the budget ones to the fanciest ones! 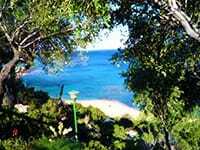 Set on the western coast of Sardinia, Bed And Breakfast Alghero is only a 5-minute walk from Alghero’s beaches. 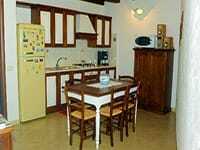 Featuring a terrace, Gioberti 25 offers simple accommodation in Alghero. The nearest sandy beach is 400 metres away. 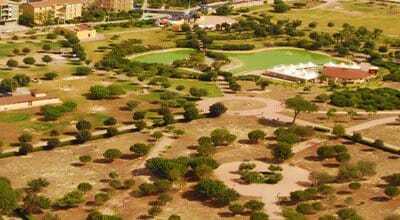 Villa Paradise is housed in a villa, just 200 metres from the coast and 10 minutes’ walk from Lido San Giovanni beach. Alghero is high on my recommended list of places not to miss when on a blissful couple’s holiday in Sardinia. Stunning Old Town with lots of atmosphere and history. Cute selection of places to eat and drink. Plentiful and varied day trips. Very popular so can be crowded. Not easy to walk between beaches and other attractions. Own transport needed for many excursions. Some areas can feel soulless. Overall, Alghero ticks many of the boxes for a fabulous loved-up vacation, but you certainly won’t find much solitude in a lot of the major places. If you are looking for love to blossom and grow on Sardinia it is really easy! There are so many delightful places that offer an exceptional couple’s romantic holiday in the sun. Beaches, nature, history, culture, cuisine, and more all combine forces to give you a vacation to remember. Porto Cervo is ideal for couples looking for glam luxury and a posh vibe close to amazing beaches. 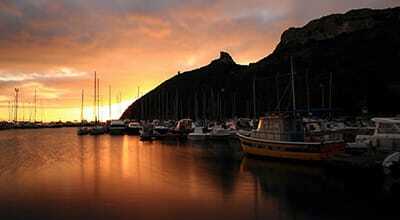 Castelsardo is quiet in the evenings and offers history, village life, and beaches. Cagliari is the lively capital with history, beaches, culture, and plenty of amenities and facilities. If you visit Sardinia, a visit to its Capital is a must! Alghero has a beautiful Old Town and a wonderfully uncontrived atmosphere. There are lovely beaches, but it can get pretty packed. 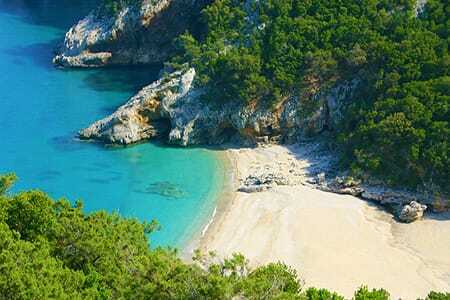 Cala Gonone is great for lovers of the great outdoors, with amazing beaches, mountains, forests, and marine caves. It has a remote feeling about it and is one of the best places for romance in the whole of Sardinia! Do you have any more things to ask about these fabulous destinations? Fire away! Leave me a comment in the section below and I’ll try to help you out! Don’t forget to Subscribe to my Sardinia Newsletter to get updates and be informed when a new post is up! Thank you so much for posting this! Me and my other half are hoping to visit Sardinia at the start of September after a hectic year so far of buying a house! It will only be for a weekend, Friday to Sunday so am hoping you can help us decide where to stay! We probably will be on foot with no other means of transport and are just looking to get away and relax. Grateful for any help you can offer! We are vacationing near Cala Gonone in a few weeks and this is the best guide I’ve seen to the region, particularly for the beaches and how to reach them. Thank you! 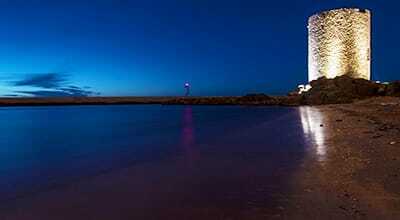 Do you know any special places that would be perfect for an engagement proposal? 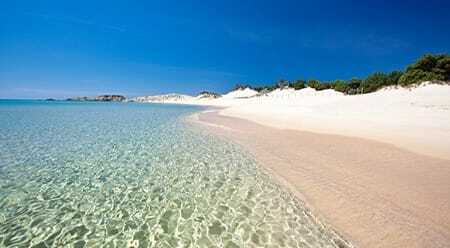 I have planned a surprise long weekend to Sardinia at the end of October. 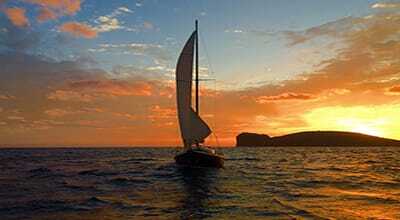 We will be in Alghero for one night and then 3 nights near OIbia. 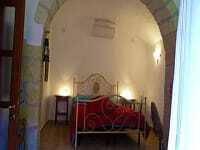 Or would you recommend 2 nights in Alghero rather? We will rent a car to get around. A scooter also sounds like it could be fun, unless it rains of course. Could you perhaps recommend a photographer who could capture the moment? My husband and I are panning a 10 trip in August and was hoping for some advice on where we should go. We will be hiring a car but ideally we would like to stay in one place. Could you recommend somewhere that has a nice beach but also within walking distance to restaurants, bars, cafes etc as we don’t want to have to drive somewhere just to eat. As we will have a car we will definitely want to do some day trip exploring so anything you can recommend would be appreciated. Where should we fly into? What town would make the best base? Would you suggest we stay in one place or travel around a bit (we will rent a car)? Any information you have would be greatly appreciated. Please let me know. Thank you for all of your help. Superbly informative page. Thank you for your time and effort to help others. My girlfriend and I are spending 10 days in Sardinia in June, flying in to and out of Cagliari. We will be renting a car. I would love to know what you think is the most economical way to fit in: Cagliari area, Cala Gonone, Golfo di Orosei, Porto Cervo and La Maddalena (if it’s reasonable to fit all this in). Would the best bases for this be Cagliari and Cala Gonone? And have I missed anything I’ll regret? Thanks for the great information on Sardinia. 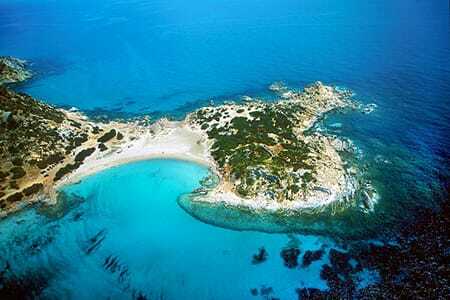 My boyfriend and I are looking at going at the end of June this year and you have really sold us on Cala Gonone! I was just wondering if there are many good bars and restaurants in that area/much of an atmosphere at night time? This is a very informed website. Thank you for taking the time to inform us of your beautiful country. 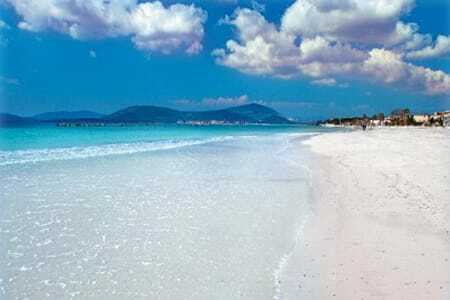 My boyfriend and I would love to spend 3 weeks to a month in Sardinia. I’d like to rent a place and then take day trips from our home base. I’d like something with little tourists, nice beaches and highly cultural. Would renting a place in Cala Gonone. Where would you suggest we rent a place and then venture out from there? Thank you for your time! 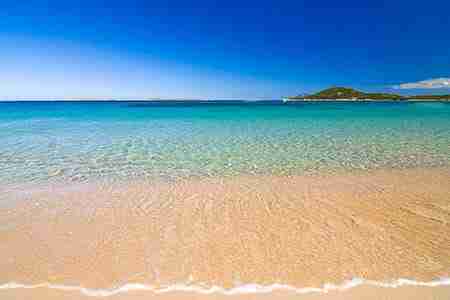 I am looking to go to Sardinia with my finance for our honeymoon in early July. We would like to spend some time exploring the Maddelena Islands as well as get in some relaxing time in a comfortable hotel while keeping travelling to a minimum. You mention 2 hotels above, are there any others you recommend in that region for our honeymoon? I am so happy I stumbled upon this post! I have been researching Sardinia all day. Going with my husband this summer and want a romantic stay. I was considering Cala Gonone, but wasn’t sure because of all the hiking it seems is involved to get to all the beaches. But after reading this post I am pretty sure we will stay there! Do you know of any easy-access beaches near by? Its great as your other posts :D, regards for posting.